After a few nights away at my apartment I came home to a surprise package from Larabar. I was delighted to open it up and see that the company sent me the new Über bars in all four flavors. When I looked more closely, however, I noticed that the bar was made of "whole fruits and nuts" and thus seems to compete with so many other fruit and nut bars out there. I thought to myself: "How many of these similar bars can the market support?" The original Larabar uses very simple ingredients (dates, nuts, sometimes chocolate chips, etc.) and so does the new Über line so I wondered how truly different they would taste. My questions were quickly answered when I indulged in the Bananas Foster and almost immediately fell in love. Damn that bar is good! It is much crunchier than a normal Larabar but still has a nice chewy side unlike some of the other fruit and nut bars on the market which are all unsatisfying crunch. Über bars are available in four flavors: Bananas Foster, Cherry Cobbler, Apple Turnover, and Roasted Nut Roll. I really liked all of the flavors but definitely think that Bananas Foster is the one I will keep going back to. I'm a huge fan of the original Larabar and infrequently enjoy the company's Jocalat but I think the Bananas Foster has quickly become my favorite Larabar favorite. I've seen these on shelves around New York City so they should be popping up in your local grocery store soon. They are definitely going to be in my on-the-go bag this summer! This past week I had the pleasure of visiting my older brother Eric in the company of my younger brother Ian and my great friend from high school, Olivia. He has lived in Los Angeles for the past four years and I try to get out to see him as often as I can. We didn't have a strict itinerary for the trip, but my pre-trip GF-scouting (along with tips from Stephen) while "studying" provided me with a substantial handful of gastronomic destinations. On Tuesday we did something that might be foreign to many Los Angelites - we used public transportation! We caught the metro out by Culver City and took it down to Union Station where we commenced a walking tour. By the time we got there over two hours and a few miles of walking had elapsed since breakfast, so we immediately set off on a hunt for a lunch venue. En route to a cafe recommended by our guide book we serendipitously stumbled upon Pitfire Pizza. Eric had heard really favorable reviews so we abandoned our other plan and went for pizza. I'm so glad we did. 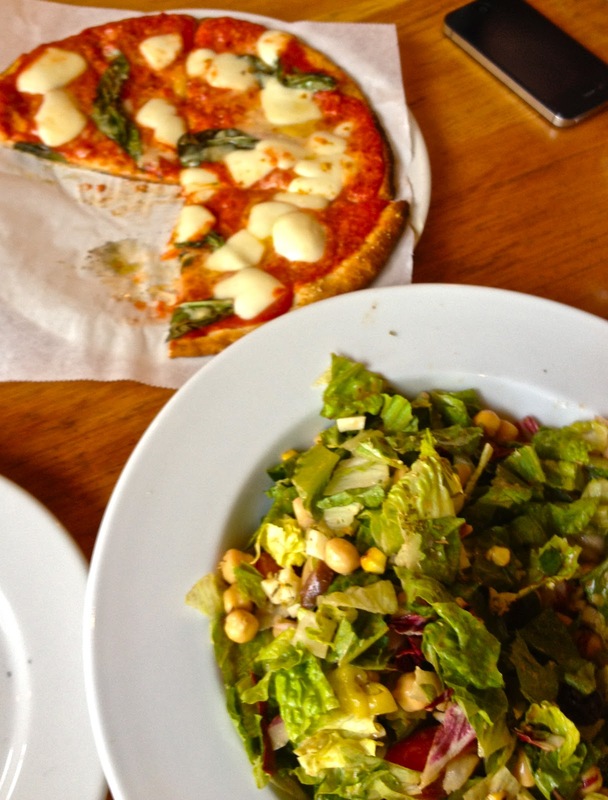 My friend Olivia and I split a GF margherita pizza and a chopped salad, both which were spectacular. I've never had a GF crust that tasty, chewy, and beautifully browned - if I hadn't had my brothers' glutinous pizza beside it for comparison, I might have doubted its lack of gluten. 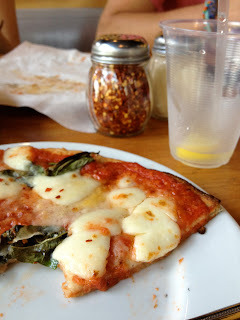 The toppings were not out shined by the crust - I'm a sucker for a tasty tomato sauce and it did not disappoint. The cheese and fresh basil rounded out the glorious preparation. 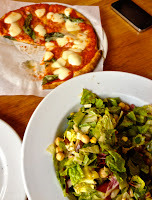 The salad was a great accompaniment to the pizza and I was impressed by its garden-freshness and substantial size. Having enjoyed our lunch so much, we weren't in any rush to leave. This promped my brothers to order a third pizza (they had already polished off two delectable if glutinous pizzas). Olivia and I split a soft-serve vanilla ice cream. It was no Abbott's, but certainly provided a great conclusion to a fabulous lunch. After a few more iced teas, we finally resumed our walking tour, thoroughly satisfied. If I had a criticism, it would be Pitfire's limited geographic realm -- I can only hope (and vouch) for Upstate NY as a lucrative future market (I'm sure Stephen would agree?). The other day my friend Alison sent me an e-mail about the opening of Pip's Place on New York's Upper East Side. I was going to run the Brooklyn Half Marathon the following day so I decided to go uptown and grab some carbs to prepare for the race. I hopped on the uptown select service bus with my trusted Kindle and, in a snap, was exiting at the 86th Street stop. As I walked up to Pip's Place I was struck by the neighborhood it is in; there are a lot of coffee shops and restaurants nearby. I'm very infrequently that far up in Manhattan and, when I am, seem to be on the west side more often than the east. Anyway, I walked into Pip's place and was instantly greeted by employees behind the counter. The shop also immediately greeted my eyes with visions of beautifully presented gluten free treats with everything from cupcakes to the bakery's own "Heath bars." I went a little wild and ordered a brownie, a chocolate chip cookie, and a Heath bar... but hey, I was doing a half marathon the next day so I deserved it, right? I sat down with my treats at the small bar/counter that is opposite the cashier and dug right in. My first stop was the chocolate chip cookie. I normally wouldn't order a chocolate chip cookie as I think it is a bit boring, but I decided to go for it to have a wide sampling of Pip's baking. The chocolate chip cookie was soft and tasted as if it had just come out of the oven. It was definitely better than a lot of other gluten free chocolate cookies I have had which are often too crunchy and end up tasting stale. My next treat was the "Heath bar," a layered bar with mashed up Heath bar on top. This was amazingly delicious; as a huge fan of Heath Bar candy I loved how Pip's replicated the flavor of the Heath Bar while amping it up with a creamy chocolate underneath the crunchy top. When I arrived home I tore into the fudgey brownie alongside a glass of Trader Joe's almond milk. The brownie was delicious, filled with great flavor and it was perfectly chewy. Just as importantly, it didn't crumble upon first bite as so many gluten free baked goods do. And, on a personal note, the race went well! I did a 1:36 time which is 8 minutes faster than my time in the last half I did in Pasadena. The course was great, looping 15,000 runners through Prospect Park and then onto a large boulevard which dead ended at Coney Island. It was a beautiful Saturday morning and there was nowhere better to be ending than at the beach. 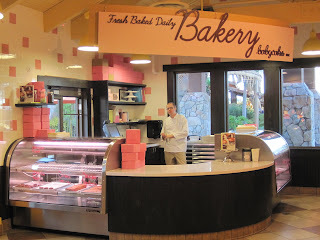 I can't believe it has taken me this long to post about one of my favorite stops in Disney World: Babycakes! When Traivor and I first decided to go to Disney World I didn't think we would make it to Babycakes as the bakery is located in Downtown Disney. 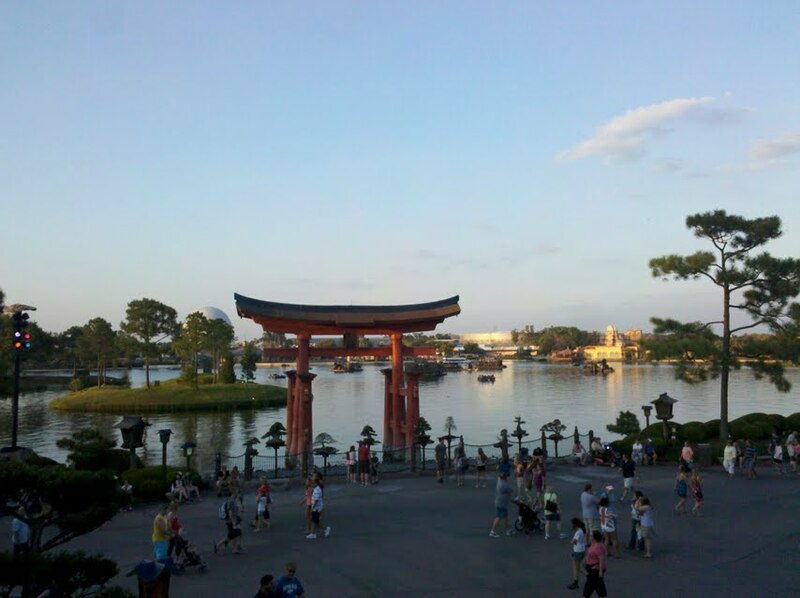 I was in store for quite the surprise when we turned our Disney World day into an adventure that spanned Animal Kingdom, Hollywood Studios, Epcot, Magic Kingdom and an ending in Downtown Disney. By the end of the day we were exhausted but figured we should check out Downtown Disney for dining options since we were already within the park and didn't have a car to check out other options. We left Magic Kingdom for Downtown Disney and were surprised by how far away it is; the bus ride to Downtown Disney was definitely the lengthiest of our day. 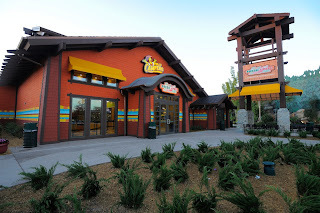 We were also surprised by how enormous Downtown Disney is, with tons of options for kids and adults alike. We started walking through the Boardwalk en route to Paradiso 37 (post coming soon!) and on our way I spotted Babycakes right next to Fresh-A-Peel. It wasn't listed on the official map of restaurants but the bakery's signage was easy to pick out, as I recognized it from my many visits to the L.A. and NYC locations. We decided to check out the bakery after our dinner. Instead of heading right over to Babycakes, however, we took a ride in a hot air balloon. This hot air balloon was giant and not a typical wicker basket hot air balloon. Instead where we stood as we went up was made of metal and felt secure; I'm not sure I could ever go up on a "real" hot air balloon ride after the fear I felt going up in this one. From the top we had a great view of the parks, the fireworks show going on around Disney World, and the water which Downtown Disney sits on. After our hot air balloon ride we made our way over to Babycakes. I was a bit surprised that Babycakes is housed in the same building as Pollo Campero as I normally wouldn't associate a vegan/gluten free bakery with Pollo Campero. I expected it to be housed within the neighboring Fresh-A-Peel, as Babycakes' mission would seem to fit better with that healthy salad shop. Nonetheless there it was in Pollo Campero - my heaven. When we walked in I ducked into the bathroom and by the time I got to the counter Traivor had talked the girl working up about what options were being offered. Sadly it was the end of a busy day and they didn't have much, but in a very sweet gesture she offered to frost me a fresh gluten free cookie 'wich, my favorite item from Babycakes. It tasted just as great as cookie 'wiches from Babycakes normally do and I was happy to have the opportunity to eat a gluten free dessert while in Disney World. Regular readers already know I love this place... and my visit to the Downtown Disney location didn't change anything. 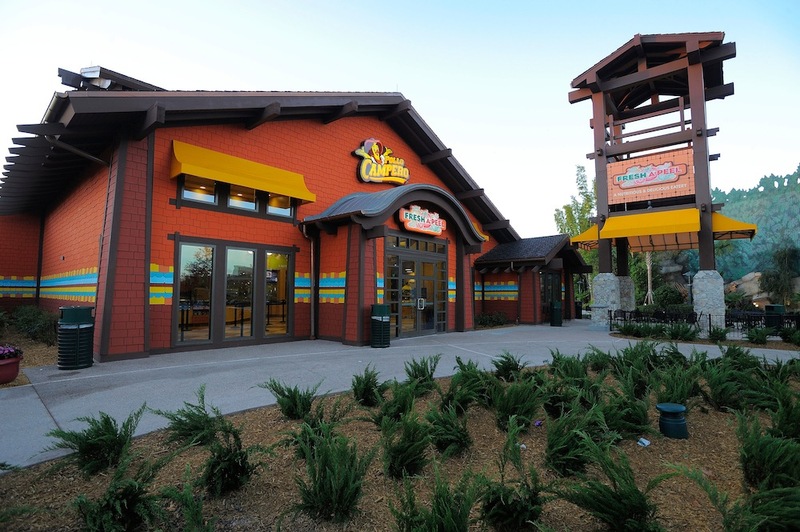 It's great to have healthy, allergy-friendly options in Downtown Disney. I can't wait to see where the bakery's next location is! 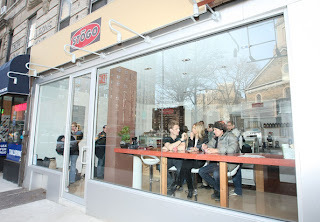 The other night I stopped in for ice cream at Stogo, which I have walked by a million times and my friend Katie has told me about. I began asking questions about the ice cream almost immediately upon entering and was excited to hear that everything in Stogo is gluten free, even the flavors with chocolate chip cookie in them! Magical, right? Stogo uses Babycakes' gluten free cookies to make that particularl concoction and sells Babycakes' cupcakes too, making it even easier for me to pick up some treats instead of walking to Babycakes' Lower East Side location. The people working at Stogo were extremely kind, offering to let me try as many samples as possible. All of Stogo's ice creams are free of dairy, animal, refined sugar, preservatives, artificial flavorings and, obviously, gluten. I really enjoyed my ice cream at Stogo and picked up a Babycakes treat to go. I would visit here again; it is a bit expensive but for gluten free vegans I definitely think this is one of the best spots to get your summertime ice cream fix. This is probably old news by now but Traivor just sent me the photo below. Looks awesome! I hope I get to a Yankees game so I can check it out for myself. As per the official Yankees website, the stand offers Hebrew National hot dogs and Premio sausages, Boar's Head deli meat, Carvel soft-serve ice cream, Melissa's farmers market vegetables and fruit salads, Kozy Shack pudding, and Famous Famiglia gluten-free pizza. Redbridge is also available at all Beers of hte World locations. 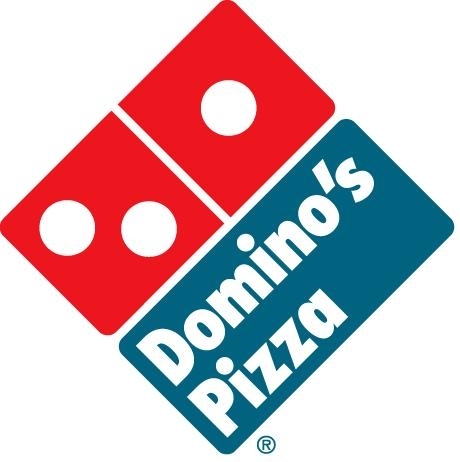 Gluten-Free Fare: There are several gluten-free food options: Hebrew National hot dogs and Premio sausages*, Boar's Head deli meat, Carvel soft-serve ice cream, Melissa's farmers market vegetable and fruit salads, Kozy Shack pudding (sold at all Highlanders locations) and Famous Famiglia gluten-free pizza (Section 125 only). Redbridge, a gluten-free beer, is sold at all Beers of the World locations. *Hot dogs and sausages not served with buns. Despite being exhausted after our day at Universal's Islands of Adventure (check out my post on gluten free eating at Universal here), Traivor and I decided that when in Orlando we should do it up... and that the only way to do that was to conquer Disney World the following day. We let ourselves sleep in and have a leisurely breakfast before we set out on Round Two of our Orlando adventures. My last time at Disney World was in 2008 with my family. While I love theme parks, nobody else in my family was enthused about visiting the parks and I couldn't convince anybody to join me. That meant that I was on my own in Disney World. In some ways it was great; I didn't have to consult with somebody else's wishes and could use the single rider line often. In other ways it wasn't great; I was alone in the Happiest Place on Earth! Luckily Traivor and I were on the same page. He was excited to hear that at my last time at Disney World I hit all four parks - that's right, in one day I visited Epcot, Animal Kingdom, Magic Kingdom, and Hollywood Studios. 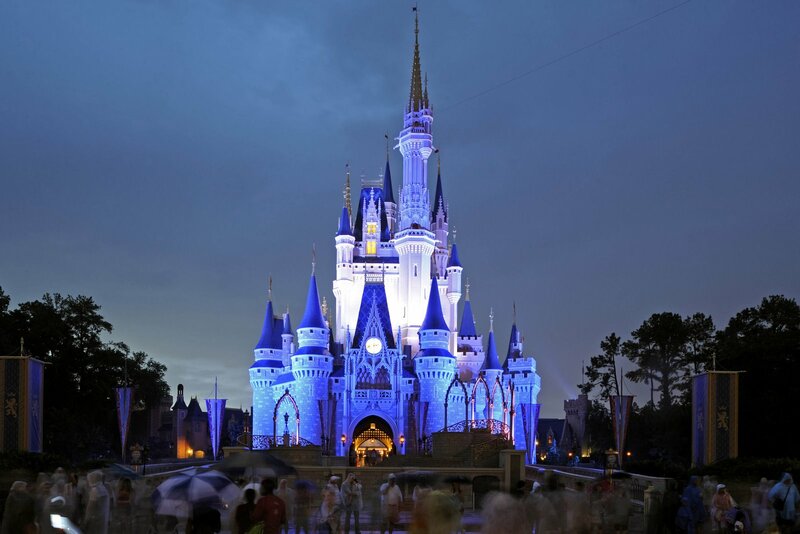 We decided to be ambitious and try for the same, especially after hearing that the Magic Kingdom park would be open 'til Midnight. Crazy! We started our day at Hollywood Studios, visiting Aerosmith's Rockin' Roller Coaster, the Tower of Terror, and Star Tours. From there we made our way to Animal Kingdom, where we did the Everest Adventure rollercoaster and the Jungle Safari. After Animal Kingdom we decided to head to Epcot, where we would try and do Soarin' and have lunch. While we made it to lunch, Soarin' was a misfire: the wait was insane and the FastPass would have had us coming back to Epcot between 7 and 8pm! Instead of Soarin' we did Captain EO, the cheesy Michael Jackson 3D show that was re-released after his death in 2009. It was made in the 80s and that time period definitely shows, but all in all it was good fun especially after having read about it in the wake of his passing. 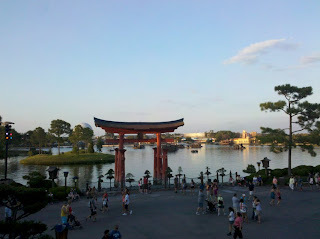 Since we were in Epcot we took a walk around the different countries, finally landing on Japan as we were both craving sushi. When we chose Tokyo Dining we made sure to tell our hostess that I am gluten free. The restaurant's manager promptly came over and addressed my dietary concerns. I was really happy to have such an attentive staff and it definitely made me feel more comfortable eating there. The restaurant also has gluten free soy sauce on tap, a nice addition that not every sushi place has. 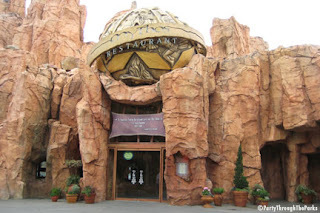 Overall our meal was tasty and less expensive than Mythos in Islands of Adventure with nice views of the large body of water in the center of the countries section of Epcot. After Epcot we headed over to our final stop of the day: Magic Kingdom. I'll have more on what we did in Magic Kingdom in my next post. After visiting Asheville and Charleston I flew down to Orlando to meet Traivor for a few more days in the sun. I was particularly excited to check out Harry Potter at Universal's Islands of Adventure, as I had never been and am a huge HP fan. 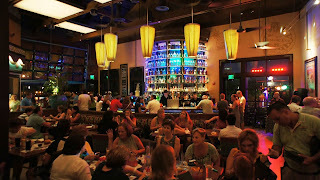 On our first night in Orlando, before we checked out HP land, we headed to Cafe Tu Tu Tango on the recommendation of our hotel's concierge. When we arrived the restaurant seemed like a lot to handle; it was loud and packed with families. We were told it would be about a 30-45 minute wait and by that point I was a bit hungry. We decided to stay after the hostess told us there was a bar we could amuse ourselves at while we waited for a table. After taking a seat at the bar we were delighted to hear that the bar was full service so we didn't have to wait for a table. 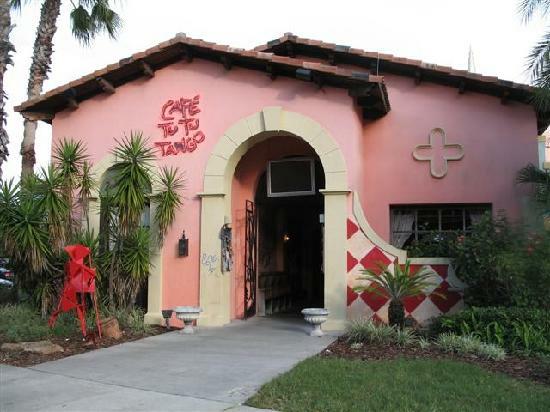 The menu at Tu Tu Tango is very interesting as it is a shmorgasbord of a host of different cuisines. Even better was that the bartender was great about guiding me toward gluten free options and brought out the restaurant's pre-printed gluten free guide. I wouldn't call it a menu as it wasn't a full menu; the guide requires that you have a regular menu as the guide only lists the name of the gluten free item, not the description. Regardless, it was a great help to be able to choose safe food items while imbibing in some delicious drinks. I convinced Traivor to order the Alligator Jambalaya with me. Being from the South, Traivor had already experienced alligator and wasn't keen on eating it again. After some light cajoling he conceded to the order and, when it was finally served, was happy to try it again. I've never had it before so I have nothing with which to compare it but Traivor said that it was much less tough than he anticipated. The jambalaya in which it was served was perfectly spiced and very tasty. We also ordered the Mediterranean Spinach Dip which came with fresh veggies and lentil chips to enjoy the dip; it was terrific. Overall, we were both very happy with our Tu Tu Tango experience. The bartender's help was extraordinary and the gluten free guide was very helpful in choosing safe dishes. 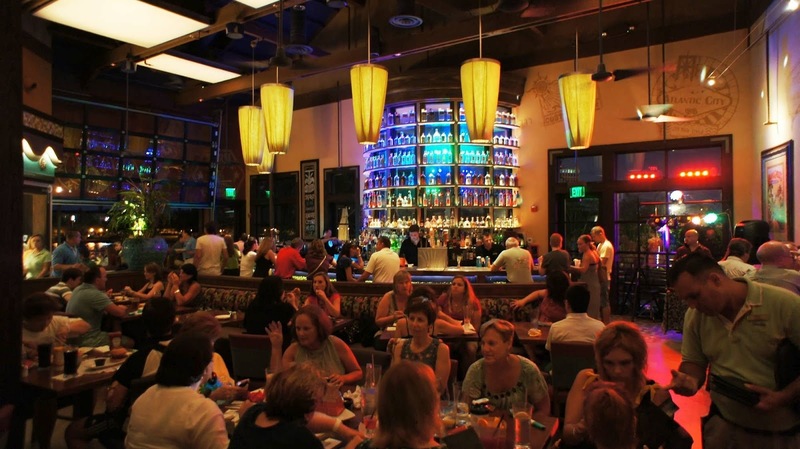 While the atmosphere was a bit overwhelming when we first walked in, sitting at the bar was a great spot to throw a few back and casually dine.